I actually think the best skimmers are sedimentary (or sedimentary-metamorphic). I think the art is equally interpretable as her being a left or a righty, them being stick figures and all. Since we can't tell the orientation of her shoulders or hips or anything. Pfhorrest wrote: I think the art is equally interpretable as her being a left or a righty, them being stick figures and all. Since we can't tell the orientation of her shoulders or hips or anything. consider the motion lines. for her to be using her right hand, they would mean she used a backhand throw, which seems unusual. Rather nicer than the Peanuts version. I don't think the motion lines say anything about that. But I think we can assume she's holding the rock in her right hand in the first panel. they clearly build a clockwise half-circle behind her body. Yeah, looking at the lines, that's either a frisbee-style throw with a hyperextended right arm, or a counter-rotating baseball-style throw with a left arm. I wonder which is better for skipping? They're stick figures: they don't have any hands, so "backhand/forehand" has no meaning. The last thing the rock heard was the Monkees' "Steppin' Stone". I feel the same way about 1I/2017 U1 (ʻOumuamua). Spending so long in the void that you no longer know whether you're an asteroid or a comet, cooling down to nearly the ambient temperature of the galaxy, then bam, you're right in the middle of a planetary system, nearly colliding with the system's star, experiencing tremendous heat you haven't felt since you first formed billions of years ago around a star whose name you've forgotten. And then it's over, and you'll probably never experience it again before your protons start decaying. ...Meanwhile the wind blows and makes the sand fly. Sometimes one of the particles, the last and tiniest form of the object I am considering, succeeds in actually entering our eyes: this is stone's special way of dazzling us and thereby punishing and terminating our contemplation. Archgeek wrote: Yeah, looking at the lines, that's either a frisbee-style throw with a hyperextended right arm, or a counter-rotating baseball-style throw with a left arm. I wonder which is better for skipping? I lived right near the ocean growing up, near an inlet where a river meets the ocean, lots of opportunity to skip rocks. I have found that the "Frisbee throw" is much less effective than the sort of "sidearm baseball throw." 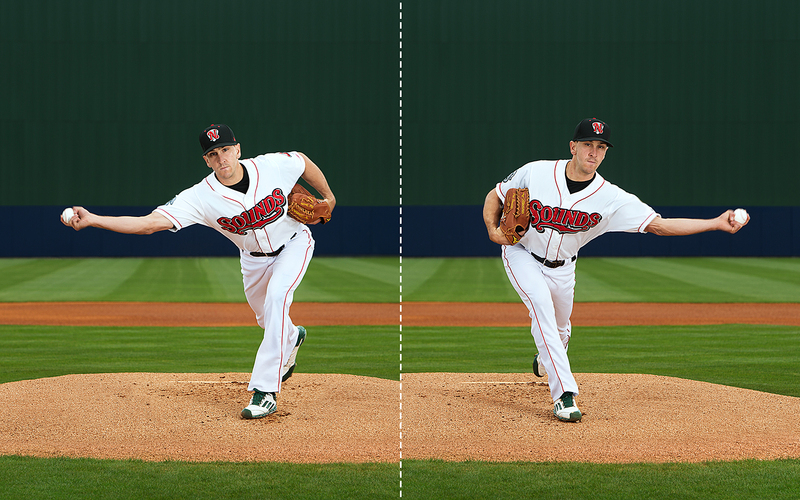 The latter lets you put far more force into the throw, allowing it to skip far more times. Okay, I am convinced that she is a southpaw. This is now canon, just need to know her name, she could be someone new. That describes precisely how I skip rocks, I will add that it helps as well to lean slightly horizontal and backwards, towards your throwing hand, and to really put your arm into it. The stone should be spinning very fast when it leaves your hand, spinning off your first finger. The goal is to have the stone moving as close to horizontal as possible when it hits the water the first time. Forehand throw with right hand, rock rotating clockwise. So probably not technically a forehand throw. Idn friabee I think it'd technically be called a push. I am not paleogeologist and the origin of the rock needs some explaining to me. Sure, it's an igneous rock, but how are they certain about its age and location? One could assuming they're treating multicellular life arising at 3.5 billion years ago (early end of the earliest occasion that it did - another whole subject of study to look at), but the knowledge of geography around then (Vallbara supercontinent?) is hghly limited. It seems that more recent supercontinents like Columbia didn't appear to have much South Pole stuff at all, that we can tell. Pangaea (mere 100s of millions of years ago, well within most of the independent multicelluar-life timelines but the earliest geologic body reliably known) scrapes through with the pre-Gondwanaland masses around the extreme southern latitudes, with what then becomes the modern south (and south-eastern 'slopes') of South America, a stripe of Africa from south to part-way up on the east, a tip of India, barely any of Australia and not all of Antarctica poking within the far-enough southern latitiudes. Alternately: There are far future xkcdians, who are actually upon Antarctica now in more northern climes, at least as far as their knowledge goes (which must be either terribly truncated insofar as their future-gistory, or else just plain wrong, regarding the known history of life between our time and theirs via some great Iceball Earth event). ¹ I recognise Goa as a tourist-friendly place, with its white sand beeches. More so than Tamil Nadu (Tamils, 'nuff said) and I'm not sure what my impression is about Kerala. ² Mostly for the lack of icebergs. 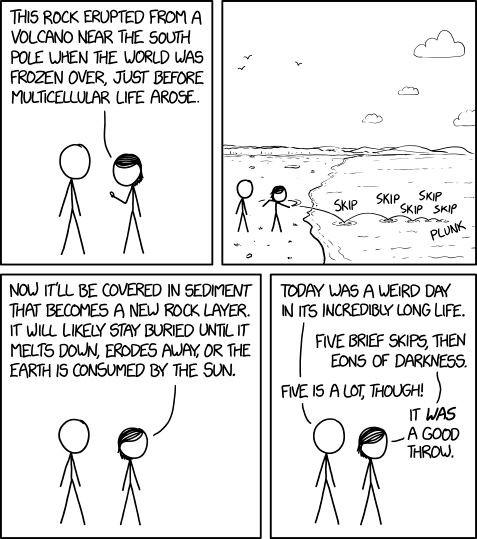 An xkcd character would holiday there, but the climate doesn' t look right. Also the wording indicates they aren't still there. which seems far more doable. I grew up on the shore of Lake Michigan and there were plenty of nicely shaped sedimentary rocks laying around, so stone skipping was a thing with me and my buds. Anything close to 10 was considered great. Anything higher than that was too difficult to count. Cougar Allen wrote: It says "Our record is 27!" I think you mistook the exclamation point for a 1. You sure it wasn't 27 factorial? That would certainly merit the exclamation point. jozwa wrote: I don't think the motion lines say anything about that. But I think we can assume she's holding the rock in her right hand in the first panel. It does look that way, but she might have her back to Cueball and is looking at him over her left shoulder. Soupspoon wrote: I'm not sure what my impression is about Kerala. I know someone who has been there several times and loves it. The FCO does not really talk the idea up much. No mention of Tamils that I saw. The Australian government likewise isn't keen on the idea. For comparison, UK and Aus advice for Denmark is pretty chilled. Sri Lanka's all green on the Aus site, too. Iran's yellow with red at the edges, and I went there and it was fine. A couple of men may have been government officials fishing for a political opinion, but I disengaged. Everyone else was ... people, and rather nice ones at that. Correct, in Ultimate Frisbee circles that is called a push throw, a variant of a forehand throw where the spin is applied by pushing on the outside edge of the disk, like you would on a rock you wanted to skip. EDIT to move this to a spoiler: A standard frisbee forehand (or "flick") throw with the right hand rotates counter-clockwise [clockwise from the left hand], because the spin is applied by pushing on the inside edge of the disk. 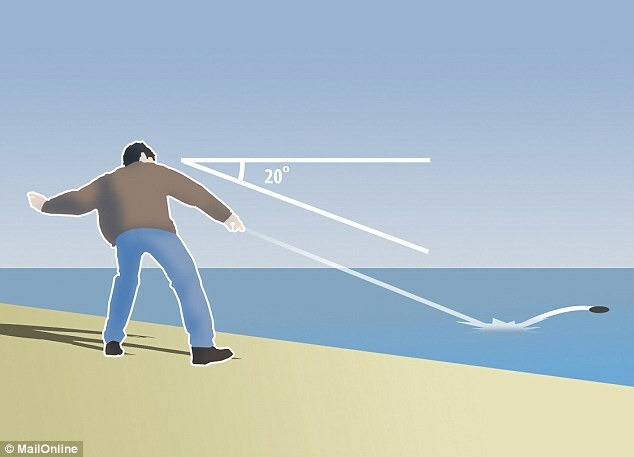 However, the large size and different grip of a frisbee makes it a very awkward analogy to skipping stones. A better analogy/description is sidearm, like in baseball, because the diameter of a baseball and grip is more similar to a rock for skipping. Jorpho wrote: Rather nicer than the Peanuts version. Agreed... and Mr. Munroe doesn't abide by nonsensical Biblical creationist concepts of Earth/time like Mr. Schultz did. Ranbot wrote: Agreed... and Mr. Munroe doesn't abide by nonsensical Biblical creationist concepts of Earth/time like Mr. Schultz did. I acknowledge that Schulz was not a stranger to the Bible, albeit nowhere remotely as heavy-handed as the likes of Johnny Hart. Nonetheless, I assumed 4,000 was an arbitrary number, as abiding to by Biblical creationist concepts would require a number on the order of 6,000. Last edited by Jorpho on Thu Jul 05, 2018 8:52 pm UTC, edited 1 time in total. I acknowledge that Schulz was not a stranger to the Bible, albeit nowhere remotely as heavy-handed as the likes of Johnny Hart. Nonetheless, I assumed 4,000 was an arbitrary number, as abiding to Biblical creationist concepts would require a number on the order of 6,000. It would require a number on the order of 6,000 years or less. The stone may have been enjoying success by sitting on that shore for some time, and the last deglaciation wasn't too long ago. Or maybe it is just a lazy rock and hasn't actually been trying for very long. Rocks going through certain phases (as this one clearly is), will lack all motivation for a long stretches at a time, punctuated with relatively short manic episodes. Slightly less, by some calculations, but certainly well over 4,000. Incidentally, was Schultz a creationist? For the first half or so of his career, I suppose, it's likely, since he belonged to a fundamentalist church, though I don't know what its teachings were on that issue. Interviews from later in his life indicate that his faith liberalized a good deal, if he kept it at all. Why? I'm assuming that even a young-earth-creationist (which I have no idea whether Schultz was or not, BTW) won't rule out the possibility that when they find a rock somewhere, it isn't necessarily in the same spot where it was Created. While that may be mildly interesting background info, it's irrelevant to my take on the comic. Schultz's comic is less interesting to me because of the 4,000 year old timeframe used, regardless of the reason Schultz used it. I don't hold any ill will towards him, but I don't feel any need to defend his comic either. XKCD's take on the theme speaks to me better. I'm also a geologist, so these geologic timescale details are probably more important to me than the average person. Soupspoon wrote: ¹ I recognise Goa as a tourist-friendly place, with its white sand beeches. More so than Tamil Nadu (Tamils, 'nuff said) and I'm not sure what my impression is about Kerala. My one acquaintance from Kerala said that "our food and our politics are the hottest in India". He brought a vegetable curry to a group picnic, and I can believe it - he "cut the spices in half so us Westerners could eat it" but it still tasted like high grade rocket fuel (and I LIKE habaneros). At that time the state had been governed by the Communist party for years.